On the Town opened at the Adelphi Theater, December 28, 1944. A musical comedy expansion of the Bernstein/Jerome Robbins ballet Fancy Free (with all new music) about the romantic pursuits of three sailors on leave in New York City, On the Town received rave reviews: “The freshest and most engaging musical show to come this way since the golden day of Oklahoma!” (The New York Times) Book (based on a Jerome Robbins idea) and lyrics by Betty Comden and Adolph Green; choreography by Jerome Robbins; directed by George Abbott. 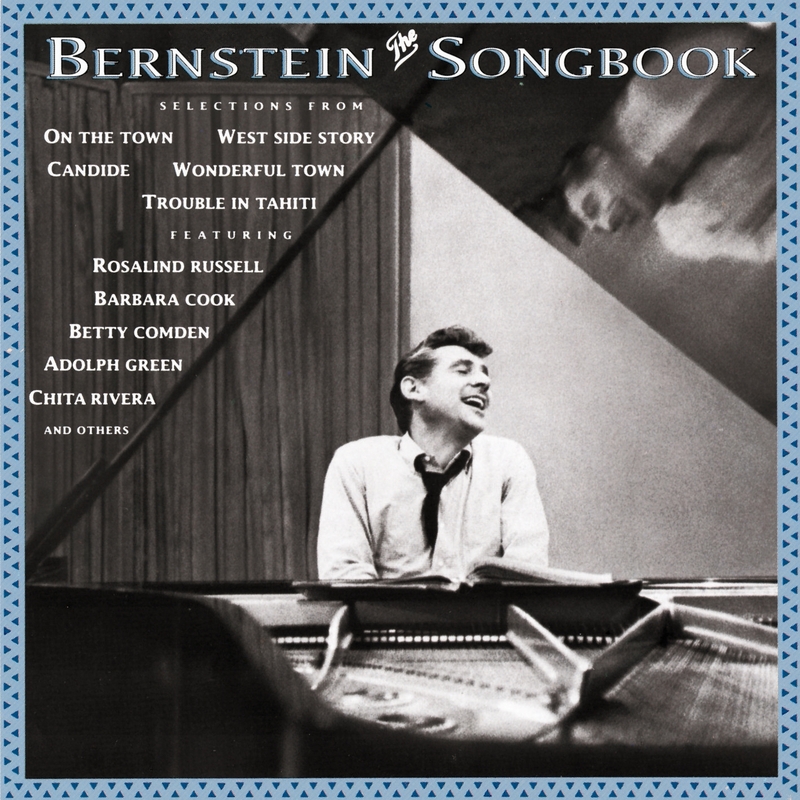 Recording produced by Goddard Lieberson, New York City, 1960; orchestra conducted by Leonard Bernstein. The version of James M. Barrie’s timeless play Peter Pan with songs and lyrics by Leonard Bernstein opened at the Imperial Theater, April 24, 1950, to the great glee of critics and children of all ages, It was directed by John Burrell and Wendy Toye; the original cast included Jean Arthur as Peter, Boris Karloff as Captain Hook, and Marcia Henderson in her first Broadway role as Wendy. Recording produced by Robert Lewis Shayon, New York City, 1950; orchestra conducted by Ben Steinberg. Trouble in Tahiti, An Opera in Seven Scenes, with a libretto by the composer, premiered on June 12, 1952, at the first annual Festival of Creative Arts at Brandeis University. According to Mr. Bernstein, “It’s a light-weight piece. The whole thing is popular song inspired and the roots are in musical comedy, or, even better, the American musical theater.” The plot humorously depicts a day in the mundane life of a suburban couple, Dinah and Sam, whose marriage is troubled. Recording produced by John McClure, CBS Studio 1, London, 1973; engineers John McClure and Larry Keyes; Columbia Wind Ensemble conducted by Leonard Bernstein. Wonderful Town premiered at the Winter Garden on February 25, 1953, and ran for 559 performances. Capturing he flavor of New York City in the mid-Thirties, Wonderful Town relates the misadventures and travails of two Midwestern sisters – one naively sensuous, one sophisticated but plainer – who seek success in the big city. The book was by Joseph Fields and Jerome Chodorov, based on their play My Sister Eileen, in turn derived from a collection by the same title of short stories by Ruth McKenney that were originally published in The New Yorker. Lyrics were by Betty Comden and Adolph Green, choreography by Donald Saddler, direction by George Abbott. Recorded in New York City, 1958; orchestra conducted by Lehman Engel. A comic operetta based on Voltaire’s satire, Candide’s short run of 73 performances (Martin Beck Theater, December 1, 1956) belied the mastery of its score. The work first found success as an Original Cast Album and later won acclaim in productions on and off-Broadway and on the opera stage; certainly Candide’s peregrinations in this best of all possible worlds have found a permanent home in the musical repertory of our national theater. The book was by Lillian Hellman, lyrics by Richard Wilbur, other lyrics by John Latouche and Dorothy Parker, Lillian Hellman and Leonard Bernstein, direction was by Tyrone Guthrie. Recording produced by Goddard Lieberson, New York City, 1956; orchestra conducted by Samuel Krachmalnick. Transformed and transported to the street-gang turf of New York’s West Side in the ’50s, the modern-day plight of Shakespeare’s young, doomed lovers found expression in Bernstein’s most popular work, West Side Story. The original production opened at the Winter Garden on September 26, 1957, and ran for 734 performances. The book, based on an idea by Jerome Robbins, was by Arthur Laurents, the lyrics by Stephen Sondheim, the direction and choreography by Jerome Robbins. Recording produced by Goddard Lieberson, New York City, 1957; orchestra conducted by Max Goberman. Mass came into being at the request of President Kennedy’s widow, whose wish it was that Mr. Bernstein write the dedicatory work for the opening of The John F. Kennedy Center for the Performing Arts in Washington, DC, on September 8, 1971. Mass juxtaposes portions of the traditional Latin text with secular sections depicting the moral crises and cynical struggles of contemporary man. Text is from the liturgy of the Roman Mass; additional texts are by Stephen Schwartz and Leonard Bernstein; choreography was by Alvin Ailey, direction by Gordon Davidson. Recording produced by John McClure at the John F. Kennedy Center for the Performing Arts, Washington, DC, 1971; engineer Don Puluse. The orchestra was conducted by Maurice Peress. Originally written for the musical 1600 Pennsylvania Avenue (Mark Hellinger Theatre, New York, May 4 1976) with book and lyrics by Alan Jay Lerner, “Take Care of This House,” as performed here, was Mr. Bernstein’s tribute to President-elect and Mrs. Jimmy Carter at the Inaugural Concert, January 1977. The live recording was produced by John McClure at the J.F.K. Center for the Performing Arts, Washington, DC, 1977. The National Symphony Orchestra was conducted by Leonard Bernstein.